Free music concerts on the run up to easter. 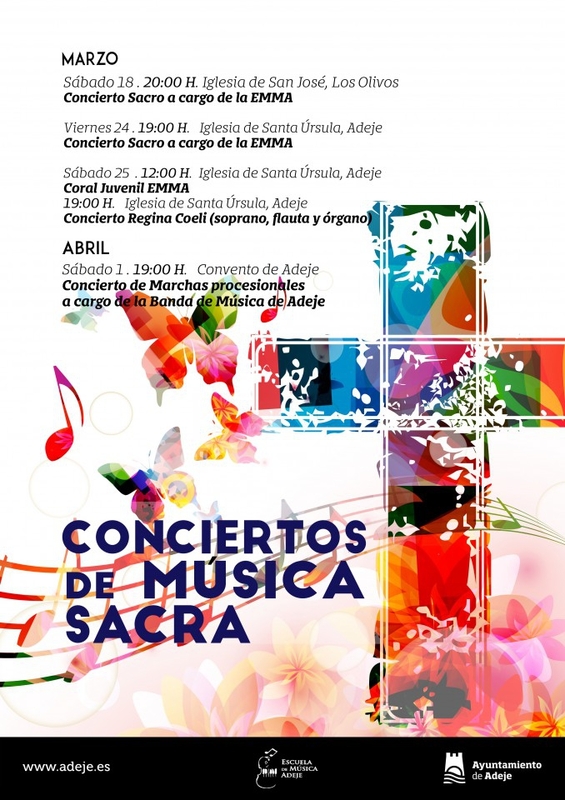 In celebration of Easter the Adeje council is putting on a series of 'Sacred Music Concerts' by the municipal school of music and the municipal band over the next three weekends. All concerts are free to watch. The first concert is on Saturday 18th at 20.30 in the San Jose Church and features members of the EMMA chamber music orchestra. The concert will be repeated at the Santa Ursula Church on Friday the 24th March at 7pm. The third concert is on Saturday, March 25th at 12.30pm in the Santa Úrsula church featuring the EMMA junior choir, and at 7pm same day same place will see the Regina Coeli for soprano taking the stage. The last concert is on April 1st at 7pm in the Convento de San Francisco with the Adeje Patron Municipal bank.